Arthur’s place – For the fainthearted . . . There were two hills that might have been climbed, Camelot or Avalon; the former was chosen. Whatever the road signs might say about the village being South Cadbury, the house names declared this place to be the seat of the last British king, the man who held back the Saxon invaders, the man who was the stuff of legends. Rain and autumn leaves had mixed to make the path a muddy and slippery ascent, but the bright morning meant the car park was filled. Wise people wore stout boots and sensible clothing, less wise people wore jeans and training shoes. A shortage of breath on arriving at the top was a reminder, if one were needed, of a lack of fitness. 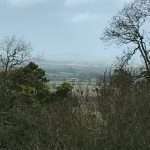 The hillfort covers a large area, and commands a vast area. The undulating lowland to the north and west could have been easily overseen by guards posted on the ramparts. Standing looking across the fertile farmlands on a fresh October morning, it was impossible to imagine the landscape as they had seen it. The enclosed fields, in their autumnal colours, are a recent occurrence in a long time span. Woodland and meadows might have more closely resembled the landscape overlooked by the fort than the regularly shaped arable fields. In the 1970s, excavations in the hillside had excited the imaginations of those of us who had grown up on the stories. We had believed that it was here that King Arthur and his knights of the Round Table lay sleeping, that they were awaiting their appointed hour. The tales of Arthur and his knights were part of an irrational buoyant childhood belief that there was not anything in the world that could not be changed. There was always hope. Stand on Cadbury Hill, surveying the country all around, and there are, carried on the wind, hints of horses’ hooves and men’s voices. Of course, they are pointless imaginings, but if life is devoid of all imagining, what then is left? The wish persists that the old tales might be true, that Arthur would ride forth from his sleep, that the knights would stand silhouetted on a Somerset hilltop, defiant in their stand against the ways of the world; that the sound of horses’ hooves and the shouts of heroes might really be carried on an autumn breeze. 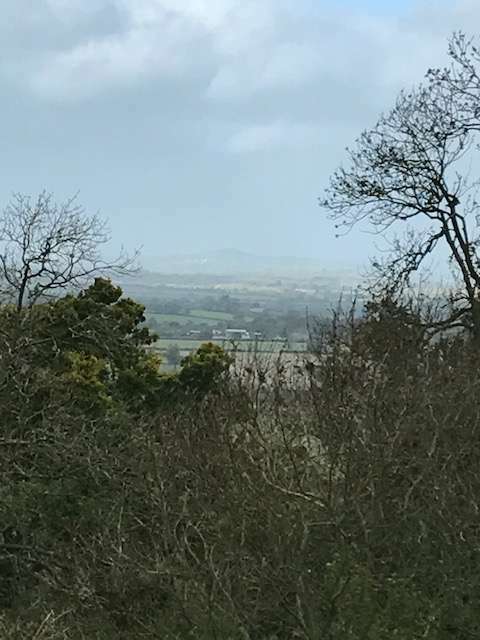 To the north, in the autumn mists, Glastonbury Tor could be glimpsed. A moment of synchronicity, Avalon, le morte d’Arthur; a declaration of the death of the legendary. It would be rather unusual that two very large ancient settlements would be in such proximity. There must have been an industry in the area that would keep supplies coming in. Maybe even a high king type of scenario, which could well cause the Avalon echo down through the sagas.